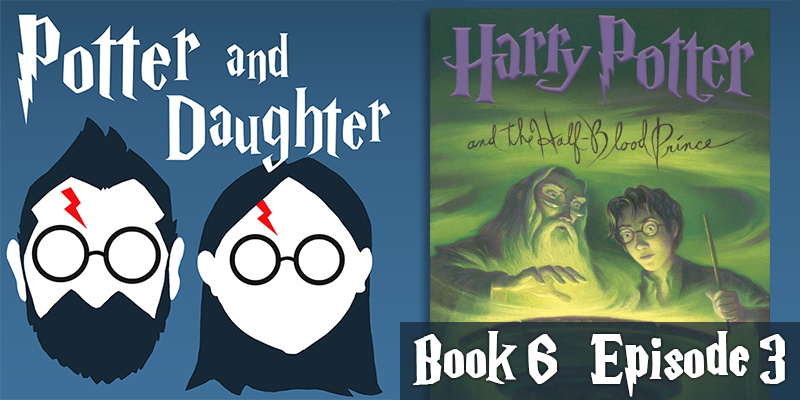 In episode twenty-five of Potter And Daughter Joel and Lily cover Harry Potter And The Half Blood Prince chapters 14-20. Harry slips Ron a Quidditch confidence boost in his drink… or does he? Ron and Hermione are on the outs and Harry is stuck in the middle. Harry attends the Slug Club Christmas party, spies on Malfoy, and rebuffs the Minister’s request for an official endorsement. Harry and Dumbledore witness more Riddle memories and the Headmaster urges Harry to retrieve an important memory from his Potions professor. Ron gets poisoned twice on his birthday. Once by a love potion misfire and again by… ACTUAL POISON! Harry joins Ron in the hospital wing after a Quidditch mishap, and orders his house elf helpers to spy on Draco. Finally, Harry and Dumbledore use the Penceive to see Tom Riddles transformation into Voldemort.